New and improved line of standard size desktop embosser seals. Our best standard sized desk seals ever, the Shiny Model ED, with rubberized feet, elegant powder finished frames, and quality that is designed to last! Most of these items (designated with “design online”) can be designed and proofed prior to checking out. If you want a custom seal embosser to adorn your desk, you need to check out our Personal Line! 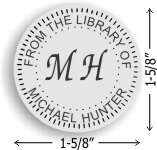 Perfect for customizing stationery, books, or adding your monogram or address to your paper products, our personalized embossers also make great gifts! If you are looking for a heavy-duty embossers, check out our Professional Line!